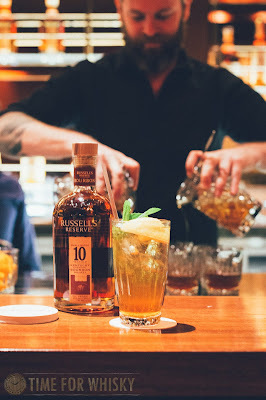 Wild Turkey Master Distillers Jimmy and Eddie Russell visited Australia in August to unveil the new Russell's Reserve Single Barrel Small Batch. The visit by the Russells also coincided with Eddie's recent promotion to the role of Wild Turkey's Master Distiller, where he will work closely with Jimmy on the production and to influence upcoming whiskies, especially in the Russell's Reserve line-up. 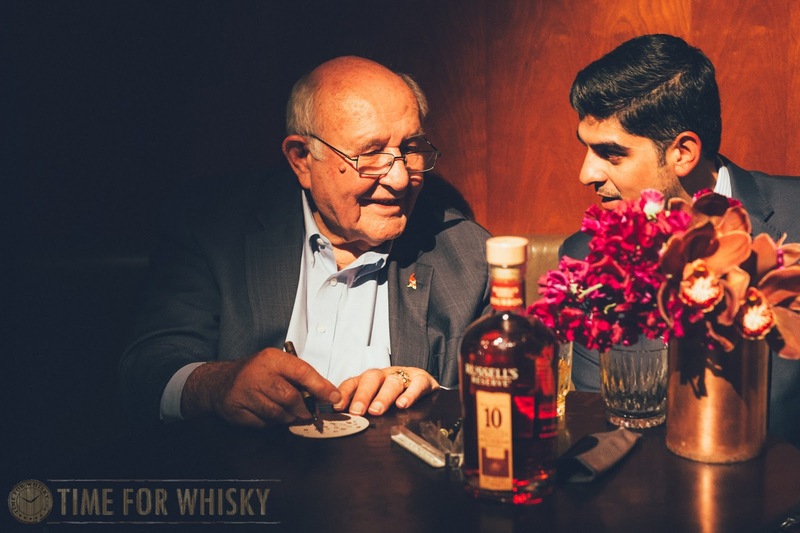 It is amazing to see Eddie follow in Jimmy's footsteps, having worked his way to the top - from being a Relief Operator then spending many years as Wild Turkey's Associate Master Distiller. 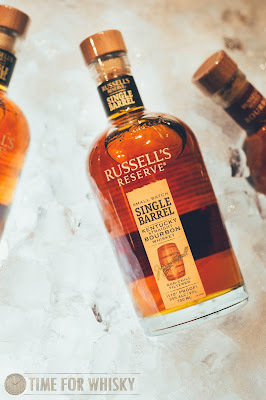 This local launch was quite exciting as we saw the new Single Barrel Small Batch release join the existing Russell's Reserve 10 Year Old bourbon, and also the soon to be released Russell's Reserve Single Barrel Rye expression that was hinted by Eddie during the event. Though a US release only at the moment, we hope it is only a matter of time before we see the rye single barrel expression locally. The event, held at Sydney's Four Seasons Hotel's Grain Bar, saw Jimmy and Eddie Russell mingle with bourbon lovers and whiskey advocates alike. Jimmy and Eddie were quite ecstatic being in Australia, noting that Australia is an important market to them, being the second biggest market for Wild Turkey outside US. 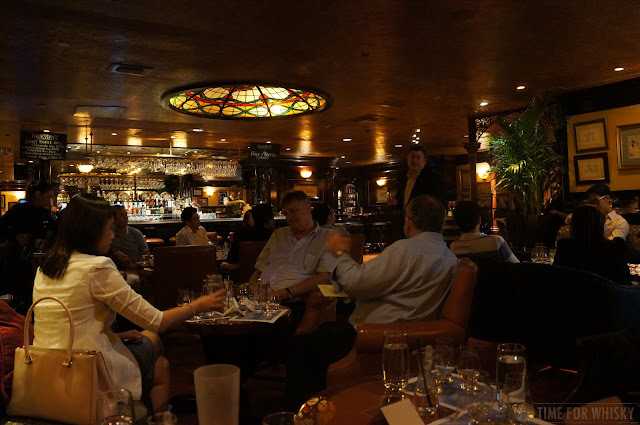 It is always pleasing to hear the importance of the local market from Master Distillers as it can tend to influence future releases locally and also provide insight into the maturity of the local whisk(e)y market. 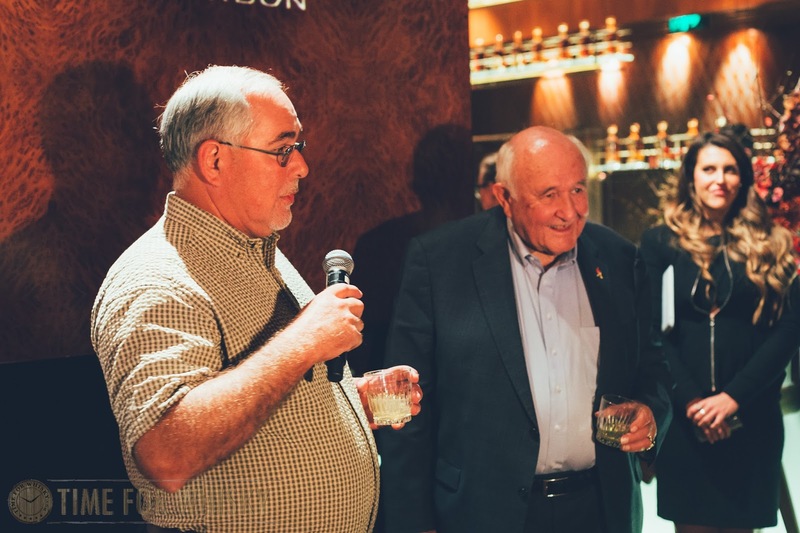 Jimmy also spoke of the interesting change in the consumption of Wild Turkey (and other bourbon) since he started working at the Wild Turkey distillery in 1954 - back then bourbon being much more of a gentleman's drink. The Wild Turkey Russell's Reserve Single Barrel expression has been curated from around 150 to 200 barrels that have been selected for each small batch. 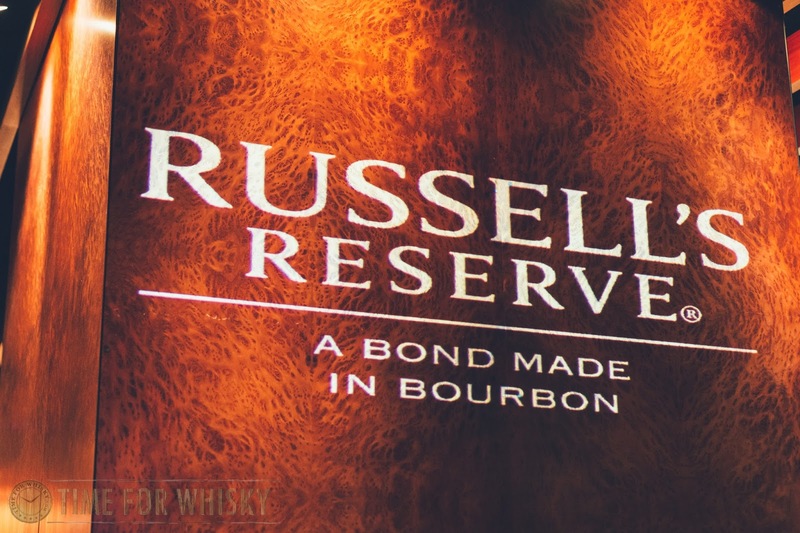 The inherent spice notes that come with all Wild Turkey and Russell's Reserve expressions are present with the Single Barrel and are complemented with creamy vanilla and subtle cherry sweetness notes. Jimmy and Eddie Russell gathered all of us together halfway through the night to join in on the tasting of the Single Barrel Small Batch and also, a treat of the rather limited Wild Turkey 17 Year Old Master's Keep Bourbon expression, supposedly Jimmy's choice of dram before heading out. The Single Barrel Small Batch expression is big, rich and bold and prominently showcases the spice notes along with the sweetness of creamy vanilla and butterscotch. The 55% ABV also provides a nice warming sensation to the overall finish. Colour: Deep copper (with an amber hue). Nose: A whiff of peppermint that is followed by rich sweet notes, layers of honey, creamy vanilla, butterscotch and then some cinnamon and clove spices come through. Palate: The palate is big and spicy, clove spice notes are initially present then followed by the rich sweetness from the nose, the creamy vanilla, caramel and some cherry notes. Finish: The finish is long and warm, most likely from the high ABV and the big spicy note fizzles out into a lingering sweetness. Big, rich and bold. .. and then the onto the Wild Turkey 17 Year Old Master's Keep Bourbon. Nose: The nose is less sweet than the Single Barrel Small Batch. There is cinnamon roll in the glass with a hint of butterscotch and then some peppermint. Star anise spice notes follow. 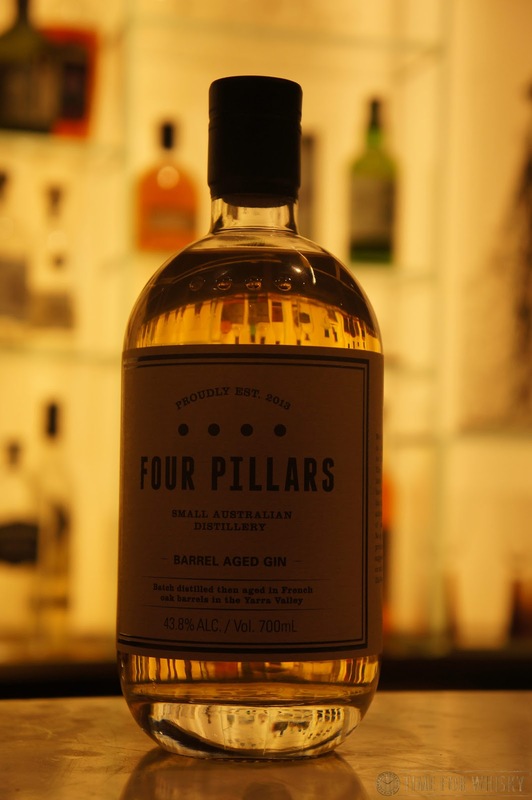 Palate: The palate presents sweet nougat notes and it is almost chalky - with a slight grainy texture that transforms into black peppery spice. Finish: Medium finish with a lingering sweetness. 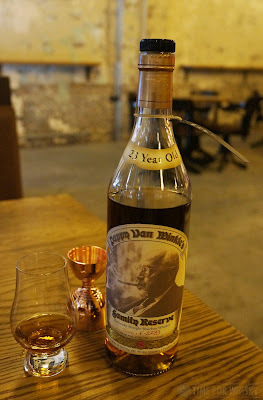 Overall, the Single Barrel Small Batch is a great expression, even compared to the 17 Year Old Master's Keep expression. Then again, personally, I do love a rich, big and bold expression. The one thing I am looking forward to is the single barrel rye release here locally. Perhaps then we can line up the single barrel rye against the six year old rye and also with the conventional 10 year old bourbon. TimeforWhisky.com would like to thank Trish Nicol Agency for the invitation to the launch event with Jimmy and Eddie Russell. Hands up who loved the lead up to Christmas as a kid, excitedly opening up their little advent calendar windows, one each day (or more, if you were impatient like me) to get at the chocolate inside? More than a few of you, no doubt. You might be grown up now (and if you aren't, you shouldn't be reading this blog!) but that doesn't mean you have to give up the 25 days of joy that an advent calendar brings. Enter - Drinks by the Dram's Christmas Advent Calendars. 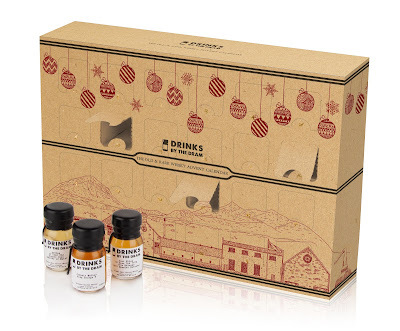 I remember a few years ago when these advent calendars were first released - there was only one (or maybe two), and while I really wanted one, I never got around to getting one (I have since sampled many a whisky through Master of Malt's 'Drinks by the Dram' samples however, which form the basis of these calendars). There are even now "Ginvent", Rum and Cognac calendars, and even a "chilli vodka" calendar (the latter we think might be taking it a bit far...). You can see the full line-up of drams in each calendar if you really want to know, or keep it as a surprise. Calendars are available for pre-order now, with shipping expected by the end of October. The full list of available calendars can be found here. 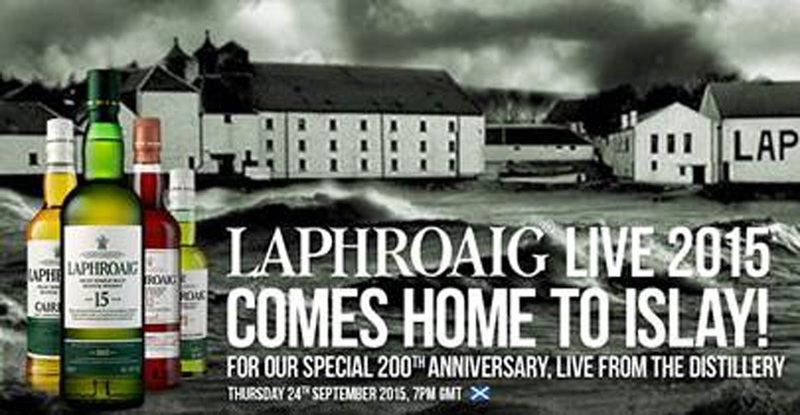 Laphroaig Live, that live annual celebration of all things Laphroaig, returns home to Islay this year, for the 200th Anniversary Celebration. Fear not though if you're not one of the 100 lucky folks to attend live though, there'll be a live webstream available and if it's anything like last year's (where over 60,000 people attended) it'll be a blast. The action happens on Friday 25th September (this Friday!) in HK and Australia - 3am HKT / 5am AEST time (Thursday 24th September 8pm UK time). Of particular interest this year is the lineup to be tasted, which includes not a single bottle that was available this time last year! 2015 FoL Cairdeas, Laphroaig 15yo (2015 release), Laphroaig 21yo FoL release and Laphroaig 32yo will all be featured, introduced and tasted by a panel including Distillery Manager John Campbell (who Hendy met recently in Sydney) along with noted whisky writers and TV celebrities. 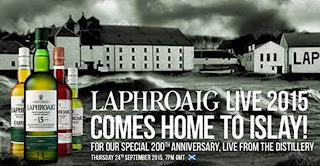 See http://www.laphroaig.com/live for all the action, where you can even download your own tasting mat to join in the fun. When we had lunch with Dr Bill Lumsden the other day, we learnt that his in-depth white paper on the "Ardbeg in Space" experimentation was due for imminent release. of key flavour-active compounds in oak wood by Scotch malt distillate. (ii) To assess the impact of maturation in conditions of micro-gravity on the flavour profile of oak matured distillate. 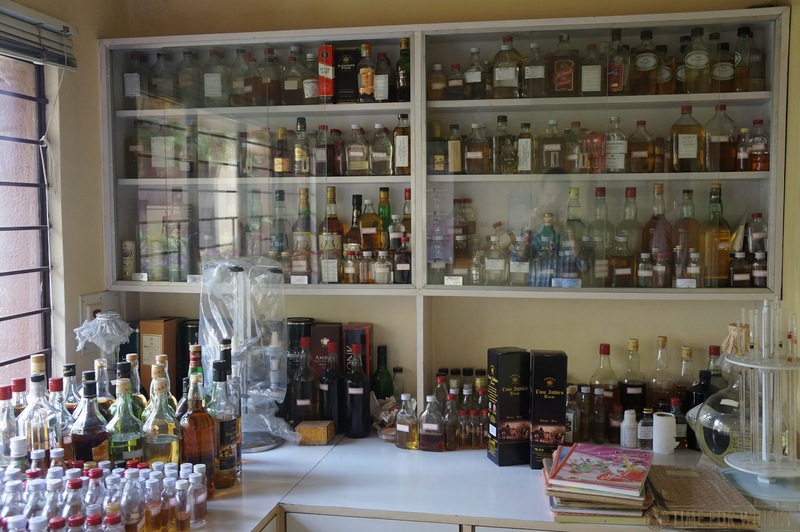 (iii) To investigate the presence of novel compounds and flavours in model maturation systems for Scotch malt distillate, as a result of conditions of micro-gravity. The white paper now been released, and can be found here. 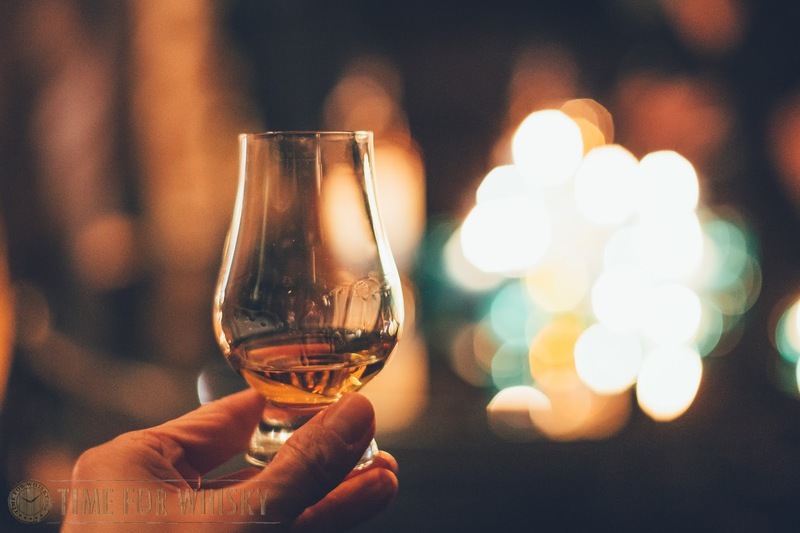 You'll have to read on to find out the specific differences Dr Bill noted (suffice to say, there were many), but it makes for some interesting reading, especially if you like to geek out of the chemical side of whisky. Focusing on those who have found success through having a "joyful outlook on life", this new global Johnnie Walker campaign is set to be one of the largest the brand has ever launched. The video (see below) represents a more energetic, "fun" angle than previous campaigns in our opinion - and there's nothing wrong with that. "Launching globally on 16th September 2015 and set to go live in Hong Kong 17th September 2015, the pioneering campaign delves into the unique science behind whether happiness can help you succeed. For the study the brand is partnering with US-based psychologist and scientist Dr Matt Killingsworth, who has reviewed decades of scientific research in his study of the topic. Joining the campaign are some of the world’s most successful people, who are among a growing number of those advocating a new approach to life, fuelled by the belief that joy is a major key to progress. Names include McLaren Honda driver Jenson Button, Oscar-nominated actor Jude Law and Chinese actor Zhao Wei, who believe that happiness actually helps people achieve more. Burn Stewart Distillers is shortly about to release the second batch of three award-winning expressions from its single malt portfolio: Bunnahabhain Ceòbanach, Deanston 18YO and Ledaig 18YO. The new batch of Bunnahabhain Ceòbanach will be introduced at the end of October 2015, while the 18YOs will be released at the end of November 2015. "Each of the three expressions embody the craftsmanship and innovation for which Burn Stewart is known, and are amongst the last created by Master Distiller Ian MacMillan before he departs the company next month. All three expressions are un-chill filtered, meaning that nothing is added or taken away, leaving the spirit exactly as nature intended. 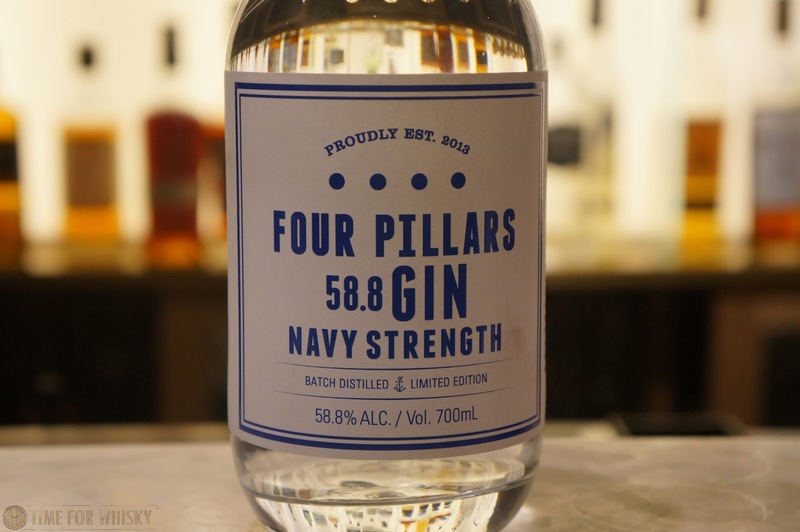 The new bottles will be distributed across key international markets including: UK, North America, Europe, Asia and Australia." We've been fans of Wemyss whiskies for a while now, having tried a few cracking ones at Whisky Live London 2015. Recently announced is a new limited edition to complement the current line-up of blends - 'Kiln Embers', a smoky addition blended with double the amount of smoky Islay malt whisky than its sister whisky, Peat Chimney. William Wemyss, Managing Director of Wemyss Malts, commented: "When I started this business in 2005, I never envisaged the amazing breadth of flavours to be found in whiskies. 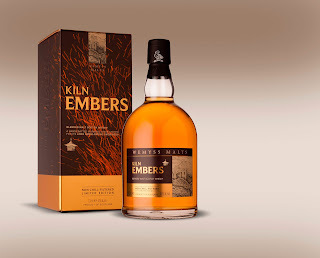 Our new "Kiln Embers" is even smokier than our existing smoky favourite Peat Chimney and is a fitting celebration of our ten years in the industry. " Glenfiddich recently announced the winner of their inaugural "Artists in Residence" Australian competition - a competition which first began in Scotland in 2002 and has seen over 100 artists mentored and tutored during 3 month "in-residence" experiences at the Glenfiddich distillery. "Glenfiddich is proud to announce dual Blackheath and Bondi resident Joan Ross as the winner of the inaugural Australian Glenfiddich Artists in Residence Competition. Opened to Australian residents for the first time, the Glenfiddich Artists in Residence Competition invited artists to enter their work, using any array of mediums which include, but are not limited to print, photography, animation, performance and installation. The judging panel lead by Glenfiddich Artists in Residence Curator Andy Fairgrieve and including the Sydney Contemporary International Art Fair Advisory Council, made up by Australian actress Rachel Griffiths, former Lord Mayor Lucy Turnbull AO, Sue Kato, Mark Hughes, Nick Tobias, Dr Gene Sherman and Evan Williams. 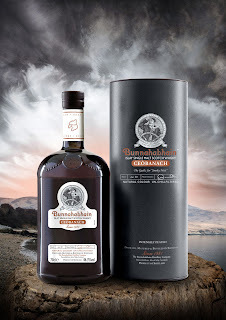 For more information visit http://www.glenfiddich.com/ or http://www.williamgrant.com/. For further information on Joan’s work visit Michael Reid Gallery or http://www.joanross.com.au/"
If you were to say our Distillery Tour posts had a theme, it would surely have to be "Not Scottish" (don't worry, those tours have happened, they were awesome, and the posts will be up soon). So far we've covered distillery visits in Melbourne, Sydney, Japan (twice), and Taiwan, and now it's India's turn. 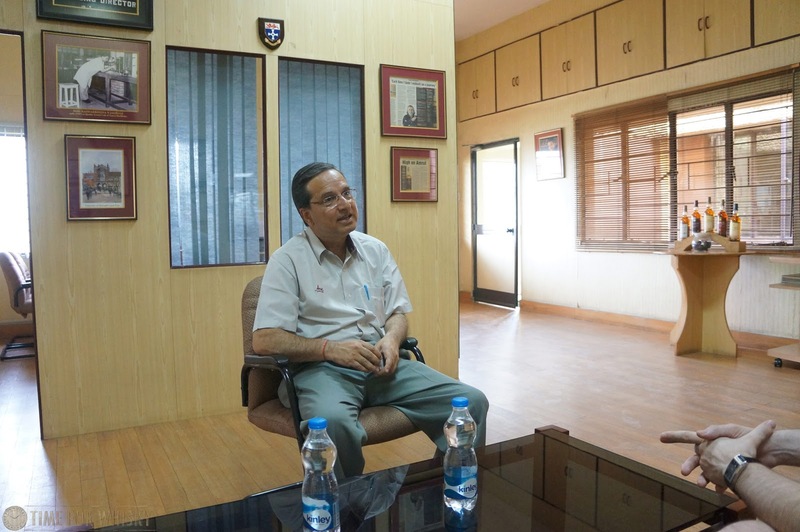 This tour was originally planned for 2013, but after having to cancel a work trip to Bangalore for personal reasons, it wasn't until 2015 that another chance came up. 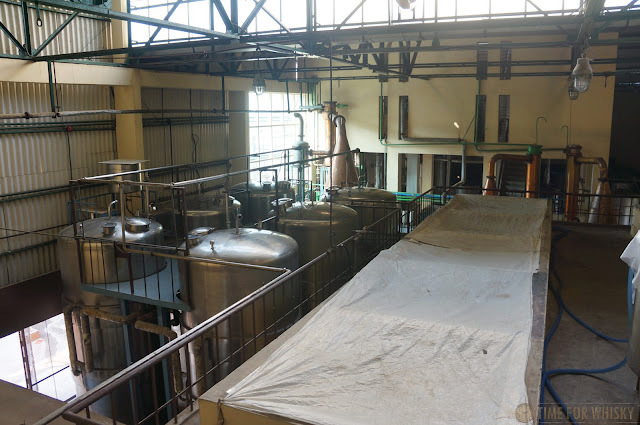 I needed to make a quick Mon-Fri trip to Bangalore for work, and took the opportunity to ask Amrut Distilleries if I'd be able to take a look around the distillery on the Saturday. Thankfully they were more than happy to have me, and so the plan was set. Saturday rolls around, and we (myself and a colleague) make the journey out to South West Bangalore (25km, a little over an hour) in a hotel car. 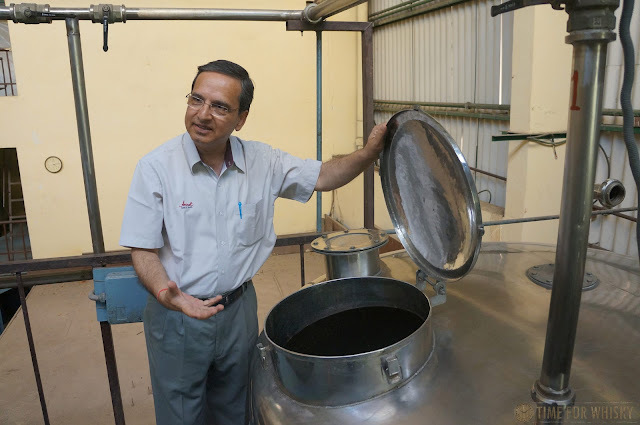 We weren't quite sure what to expect, but we did learn that our tour would be conducted by Master Distiller Surrinder Kumar, who had kindly come in on his day off to show us around! 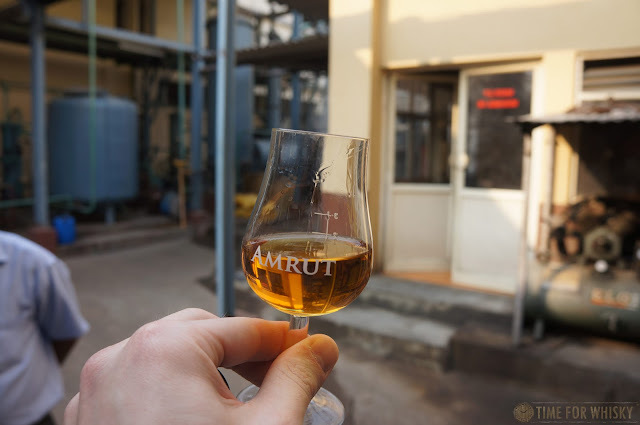 Surrinder, with a whopping 29 years of experience under his belt, started by talking us through the fascinating story of how Amrut Single Malt came to be, and how even though it makes up an incredibly small percentage of their total output (details further on), it's put them on the global map. 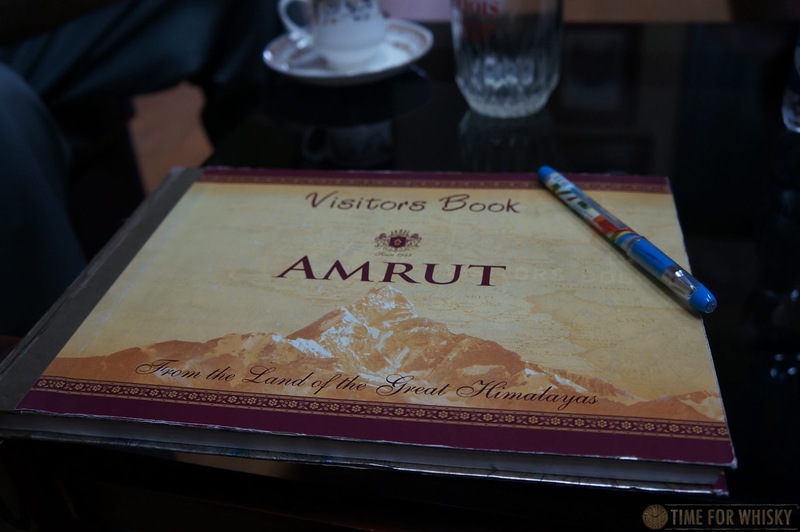 To most whisky drinkers, Amrut was unheard-of until their single malt started gaining a global following in the late 2000's. 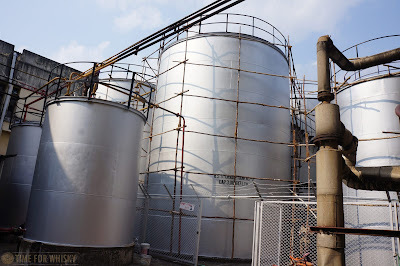 The company however has been actually been making spirit since 1948 (initially "IMFL", or "Indian-made Foreign Liquor" distilled from molasses), and was producing Indian "whisky" a long time before the single malt came along. In fact, an excess of malt whisky (previously used for blending popular local Indian blended "whiskies"), which the distillery noted was of significantly higher quality than most other Indian whiskies, was one of the catalysts for the launch of Amrut Single Malt. 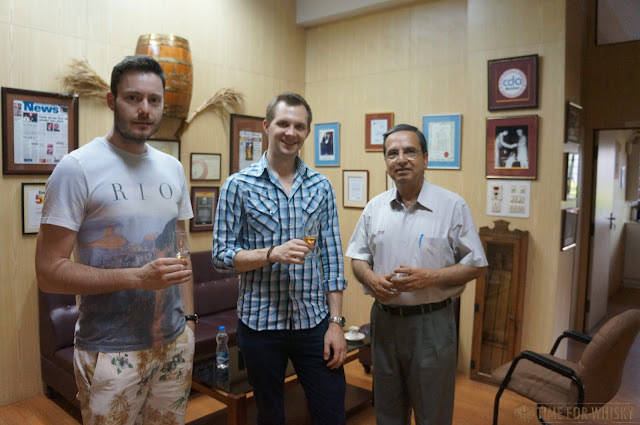 3rd generation owner and son of current Chairman, Rakshit Jagdale (studying his MBA at the time in England) was asked to investigate launching a single malt product outside India, starting with the UK. The product was already there - they just needed to get it into the public's conscious. 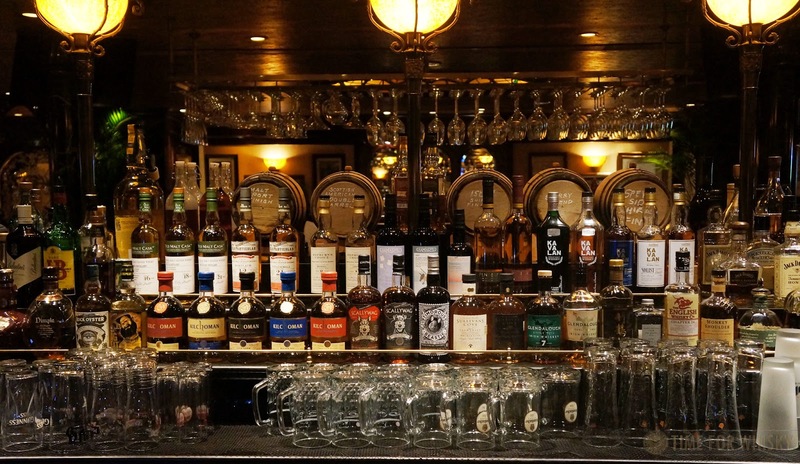 Research showed that the public perceived it to be similar in style to a 15-18yr old Speysider, and so a plan was drawn up to launch it in the UK - initially in Indian restaurants, taking the same approach as Indian beers like Kingfisher and Cobra. 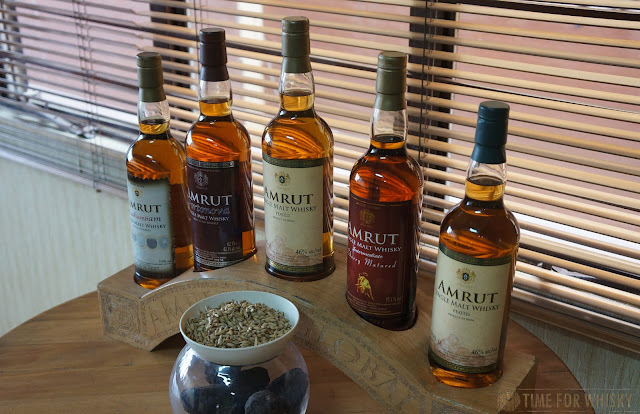 After some time, volumes weren't picking up and the company considered ending the project, but (taking a renewed spirit of perseverance from the Gahdhi statue in London), Rakshit forged on, seeking importers for each country and...well the rest is history, with Amrut currently available in 22 countries (although still very limited in India). 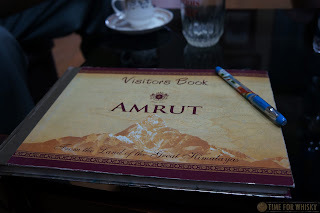 I mentioned Amrut Single Malt being an "incredibly small percentage" of Amrut's total production. How small? Well, there are approximately 14,000 x 4.5L cases of Amrut Single Malt produced each year (a total of 63,000L), compared to 200,000 x 9L cases produced of all other products.....per month! 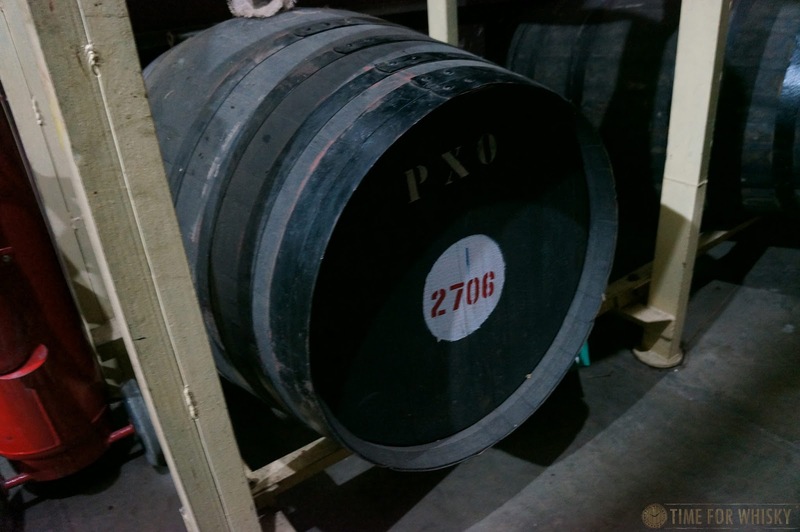 In other words - 21,600,000L, making the single malt about 0.2% of total production. A very successful 0.2%, you'd have to say! 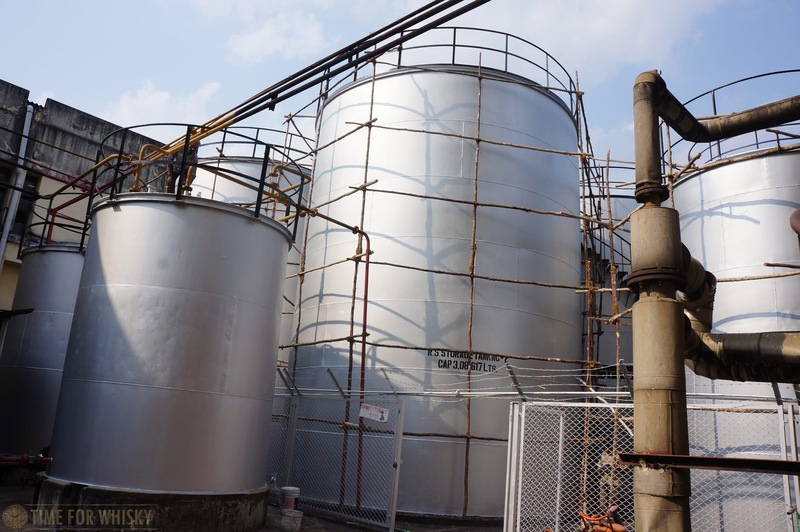 Unsurprisingly, Amrut can't keep up with worldwide demand for that 63,000L, and are currently increasing warehousing from their current 6 warehouses. 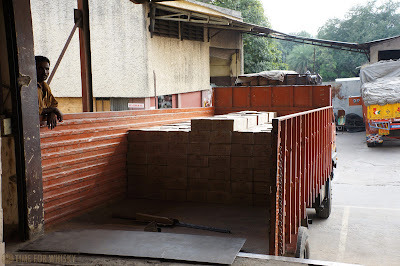 They're also experimenting with temperature-controlled warehouses, like some Bourbon distilleries in the US, but for now it remains an experimentation only. Just before Surrinder took us out to tour the operations, he mentioned that a new product was on the horizon - "Greedy Angel's Chairman's Reserve", at an incredible 10 years old ("incredible" considering the distillery experiences 10-12% Angels' share each year). That product has since been released (and likely sold out) - and comes with a 50mL cask-strength sample of the whisky at 71% ABV. By this stage we'd spent a good 90 minutes with the clearly passionate Surrinder, and our tour was no less comprehensive, taking another 90 minutes and showing us into all facets of the operation, which employs hundreds of staff from Bangalore. 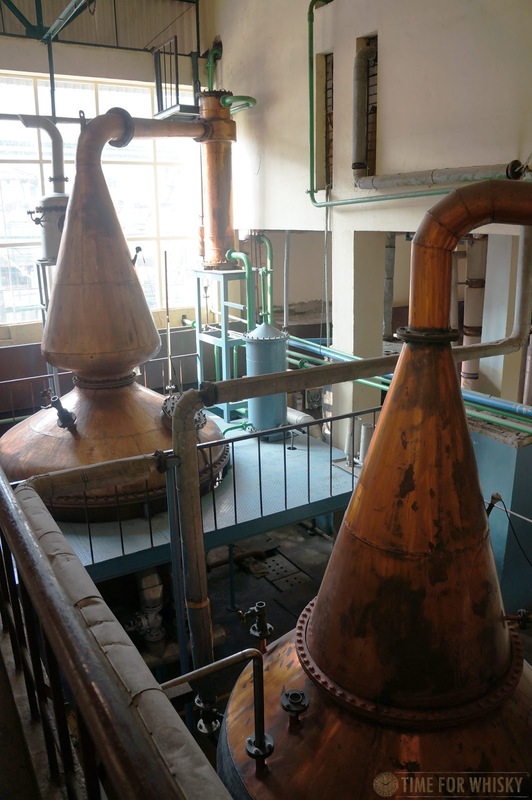 Production of all products occurs via two 7.5hr shifts each day, with the single malt being distilled on a Monday. Temperature controlled fermentation takes 1 week (kept under 30degC), and whilst we didn't get to taste the wash (at 6.5-7% ABV), we did taste the new make (73% ABV off the still, 63% ABV into the cask), which was fruity, oily, rich, subtly peaty (on the palate, not the nose) and incredibly smooth. Nose: Light, citrusy. Lemon oil. Some esthers and some caramel chews. Palate: Light, zesty. Lemon cheese cake. Young and hot, but very drinkable. In another 12-18 months I imagine it will be incredible. Finish: Very long, lots of caramel chews. Rating (on my very non-scientific scale): 91/100. Can't wait to see how this turns out. Exciting stuff. 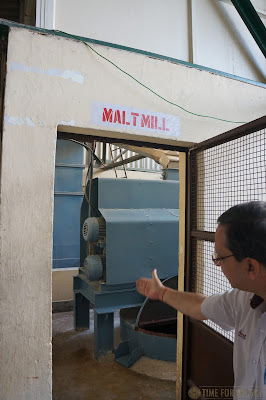 After a look at the malt mill, the delivery setup (which receives 16-17 trucks per day) and the fermentation tanks, it was time to venture into one of the warehouses. Maturation Warehouse 1 (just next to the still room) is home to casks racked 5 high, including a few weird and wonderful whiskies which have featured in recent and soon-to-be-released (we hope) whiskies. Chief amongst these was this cask of Amrut "Naarangi", which saw Amrut age sherry infused with orange peels in the cask for 3 years, before emptying it, then ageing an already 3 year old sherry-matured Amrut for another 3 years in said cask. The resulting whisky is said to have some subtle, but noticeable orange notes, without being considered a "flavoured" whisky. That's right - Tetra-pak "whisky"! This is an example of the local blended "whisky" Amrut produces for the local market, and sells for mere cents. 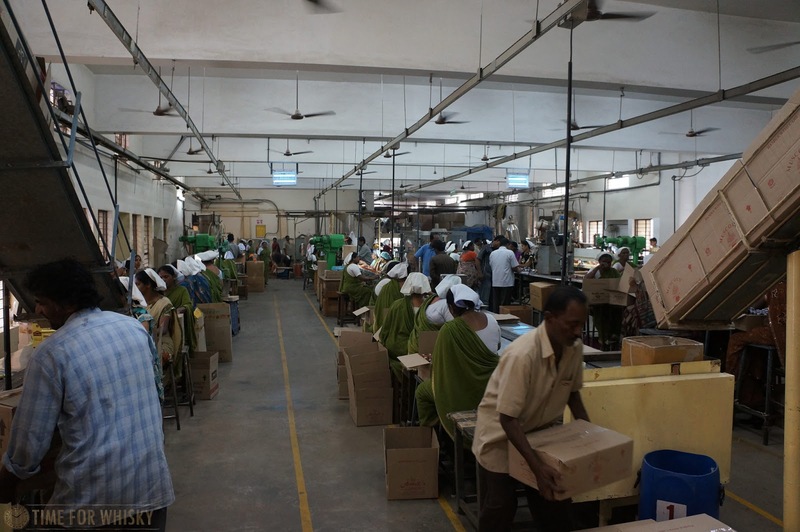 The packaging line for these products runs 24 hours a day - such is the popularity of these throughout India. Having seen the production, ageing and packaging facilities, it was time to visit Surrinder's "lab", with a variety of International and local whiskies, and several single cask samples (Amrut do a great private cask program, which was taken up by Dram Full with the recent Dram Full Amrut bottling - now sold out). 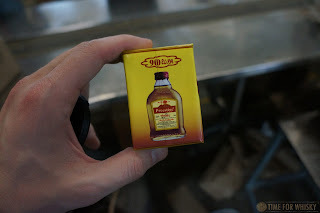 Amrut aren't allowed to sell any bottles from the distillery, but we were kindly gifted a 50mL mini each - continuing my tradition of collecting miniatures from distilleries I've visited. ..and with that, it was time to draw the tour to a close, and head back to the city, then the airport, then back to HK. An extremely informative and enjoyable day, and a tour I'm very glad I (finally) got to take. A huge thanks must go to Surrinder, Ashok and Pramod for making this tour happen - especially Surrinder for spending so much time with us on his day off. If you ever find yourself in Bangalore and have some spare time, I can highly recommend booking a tour of this fascinating distillery. Having run this blog for a few years now, we're lucky to get regular invites to various industry / media / trade events - many of which you end up reading about here. There's still the odd event though that we stumble upon completely by chance - this one being a perfect example. 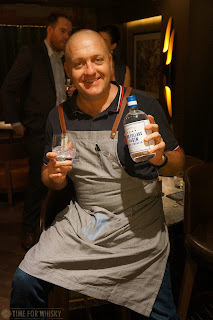 A few weeks ago I was at Tiffany's New York Bar in the Intercontinental Grand Stanford Hong Kong, enjoying a cold beer (respite from the stifling summer heat) ahead of an epic Islay whisky dinner, when I got chatting to their affable resident manager John. 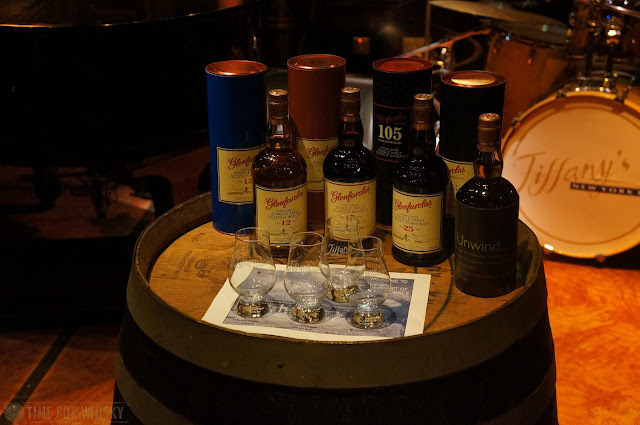 In the course of conversation, John mentioned that in just over a week, George Grant of Glenfarclas (Brand Ambassador and 6th Generation family member) would be hosting a tasting at the bar, and would I be interested in joining? You don't have to ask me twice! 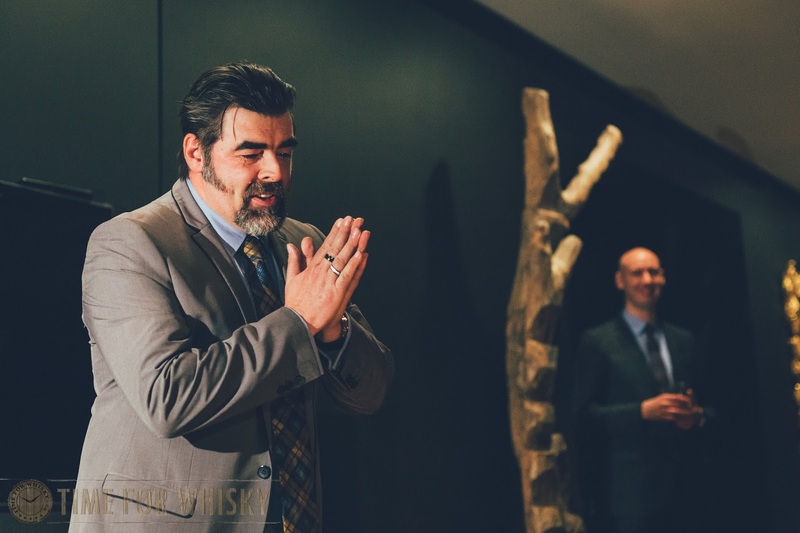 This would be the second noted Speyside figure I'd be meeting in Tiffany's in just a few months (the other being David Stewart of The Balvenie, back in June), and a good chance to speak to "the man behind the brand", after Steph and I had just visited the distillery a few weeks earlier. 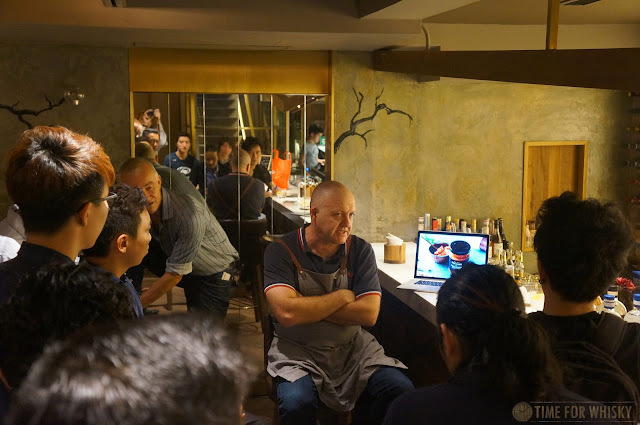 Having been to our fair share of tastings over the years, we've discovered there are brand ambassadors / master distillers who really need to work to hold the attention of a room, and there are those to whom it comes naturally. George clearly falls into the latter group, with his open, honest and humorous demeanour befitting his family-owned distillery perfectly. Explaining the family naming convention (John, then George, George, George, his father John, and George himself), George recalled being slightly shocked at first seeing a grave with "his" name on it (actually his grandfather's), but slightly more at ease when he walked into one of the warehouses and realised there were also 55,000 casks of whisky with his name on them (enough to put anyone's mind at ease, we think). Translating to "Valley of the Green Grass", Glenfarclas remains wholly family-owned to this day, which makes their global reach (76 markets until they added the Caribbean, bringing the total to 102 countries) all the more impressive. It was interesting to note that Germany is their largest market, and was the sole driver for their recent "Trilogy" series. George also had some other interesting insights, such as the myth of the "great Chinese whisky market" (which in his opinion, doesn't exist) and the growth he's seen in whisky in HK, having previously lived here for 12 years. Nose: Flint, spice, a hint of smoke. Definitely sherried, but a "fresh" sherry - vibrant and youthful. Palate: Spice, cinnamon, oat cakes and Brazil nuts. Slightest hint of smoke. Finish: Medium length, spicy. Slightly "thin" towards the end. Rating (on my very non-scientific scale): 90/100. A simple, easy drinking, every day dram. Originally released exclusively for Japan, then HK, then other Asian markets, and now everywhere. Nose: Well-rounded and sweet. Dried fruits, cherries. Almost port-like notes, and a lot of crème brûlée. Palate: Smoother than the 12, but still with some of the spice the 12 showed. Much sweeter though, more "chewy", and more legs on the glass. More mouth-filling, more Oloroso notes. Finish: Medium to long. The spice tones down and the Christmas cake notes amp up. Lots of Brazil nuts. Nose: A hint of flint, orange peel, a little crème brûlée, and strangely, a hint of salty sea air. Palate: Much more sherry influence than the nose suggests. Lots of raisins and other dried fruits, nuts, but also big citrus notes. Finish: Long. Slightly drying, bitter dark chocolate-dipped orange slices. George's grandfather's favourite apparently - so much so that he was secretly squirrelling away 6 bottles a week - 3 from George, and 3 from George's father! Nose: Huge toffee notes. Overwhemling(ly good). Dark chocolate. Thoughts instantly turn to dessert. Palate: Big, slightly hot, lots of dark chocolate. A few drops of water adds some heat and orange zest. Finish: Long, slightly hot, but smooth. Oranges and toffee. Rating (on my very non-scientific scale): 93/100. Yes please. I tried this a few weeks earlier at the distillery, and enjoyed it just as much the second time around. As the notes show, quite different to the previous drams! Nose: Sugary sweetness - cola bottle lollies, and some pine nuts. Quite a mix! Palate: Honied sweetness gives way to Brazil nuts, all with an undertone of those cola bottle lollies (which I loved as a kid). Unique, different...which really is what you want when you're paying significantly more than the standard 17yo! Finish: Medium to long, with some residual barbecued meat notes at the end. Happy Birthday George, and thanks for a fantastic tasting (and for signing my bottle of £511.19s.0d)! Keep an eye out for our write-up of the Glenfarclas distillery tour shortly. 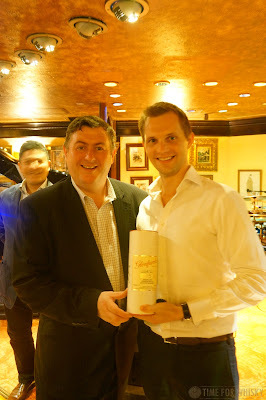 TimeforWhisky.com would like to thank InterContinental Grand Stanford Hong Kong for the invite, and George Grant for giving up his time (on his birthday no less). 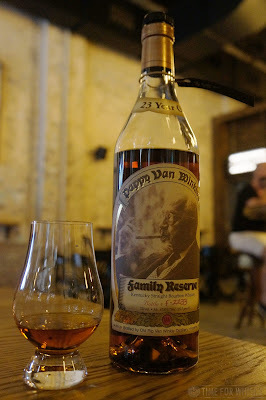 Pappy Van Winkle's Family Reserve 23yo, from the "Old Rip Van Winkle Distillery" (which is actually not a distillery, but a company who contract distillation and bottling to the Sazerac Company at its Buffalo Trace Distillery in Kentucky) doesn't need a whole lot of introduction. 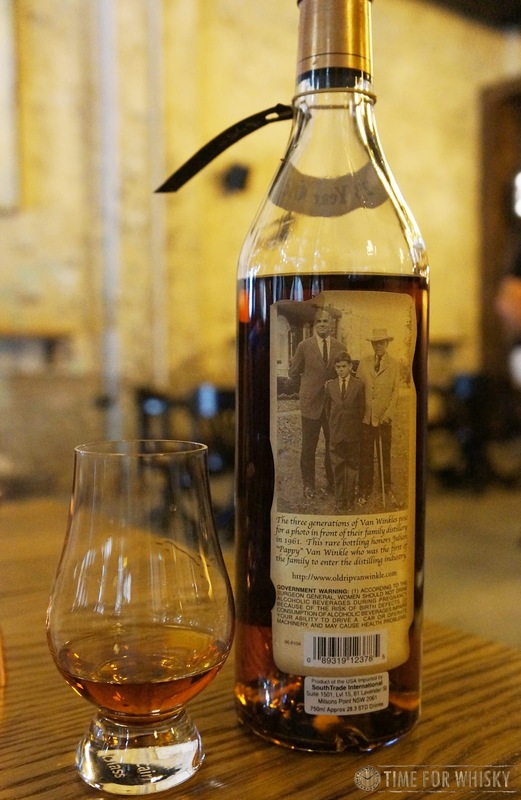 Retailing for $249.99USD each year, and selling out approximately 3 seconds after it goes on sale each year, this is about as rare and sought-after as Bourbon gets. If you found one for 3-4 times that price, you'd be doing incredibly well. Just look at how much a few bottles went for at the recent Bonhams Hong Kong auction. I knew it wouldn't be easy to find when I added it to the list in February 2013, and it only got more difficult as time went on. I found it (for a reasonable price) on the menu at the Macallan Whisky Bar & Lounge, Macau, but sadly they ran out the week before. Colour: Deep, dark, almost impenetrable copper. Some of the longest legs you've ever seen. Nose: A big bouquet of floral, caramel vanilla at first. This is definitely a bourbon, and an exquisite one at that. A second nosing brings out some faint earthy notes - vegetation, with a slight dustiness. 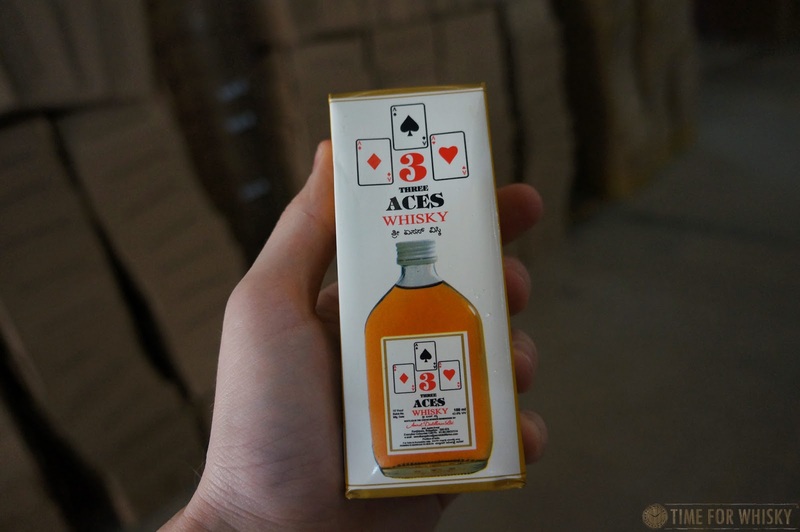 Palate: Earthy, nutty, big caramel but also nougat. Leather and some oak (the latter being remarkably refined for such an old bourbon). The slightest hint of chlorinated pool water(?) - that was an odd one, but it was unmistakably there (no there were no cleaning solvents around me at the time...) - quite a lot going on here. Finish: Long, lingering, vegetal notes with some boiled sweets. Cheese cake with a side of banana nougat. Lots going on here too - right to the very end. Rating (on my very non-scientific scale): 94/100. An experience, for sure. A complex and delicious one, too. The Glenlivet, as a single malt brand, has a remarkable global standing, being the second biggest selling single malt globally after Glenfiddich and also being the biggest selling single malt brand in the US and also here in Australia (Martin: Although according to the folks at Glenfiddich when we visited a few weeks ago, they've actually been overtaken, and The Glenlivet now holds the #1 global spot). 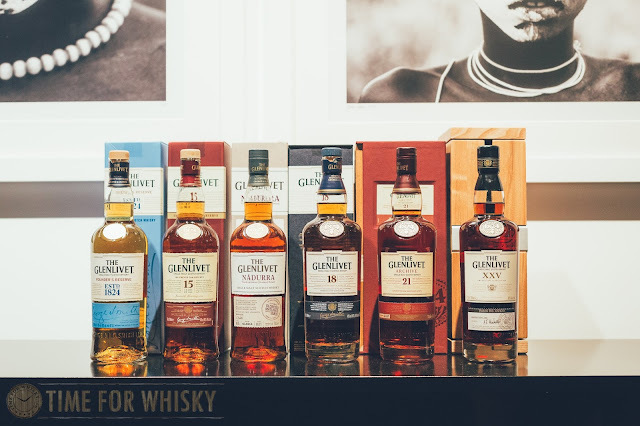 Locally, the Glenlivet shares similar fanfare with its core range of the 12yo, 15yo and 18yo (as well as the Nadurra, 21yo and the 25yo XXV). Its long-standing 12yo expression had remained a consistent winner locally with its sweet, pleasant and smooth notes at a price point that would not put much of a dent in the pocket. With the launch of the Glenlivet Founder's Reserve (a new NAS release), it has been confirmed that the 12yo will be phased out in Australia by year end - having been (technically) replaced by the Founder's Reserve. The 12yo will remain available in some markets globally (Hong Kong for one, where two different 12yo variants are readily available). 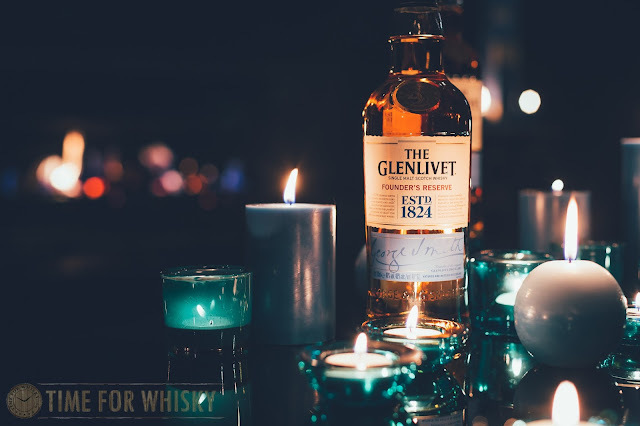 The new Founder's Reserve expression was described by Ben Davidson, The Glenlivet Brand Ambassador as an expression that was carefully curated by Alan Winchester, Master Distiller of The Glenlivet, to pay tribute to founder George Smith who had founded the distillery in 1824. 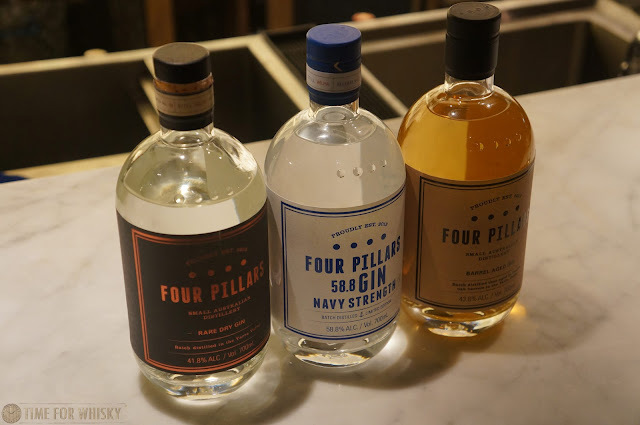 To celebrate the release and to preview the Founder's Reserve, Pernod Ricard held a launch event at an exclusive penthouse residence in Elizabeth Bay, Sydney. As with previous Pernod Ricard tastings and launch events, we knew that this event was not going to be an ordinary affair (back in 2013, Pernod Ricard hosted the launch of 'The Guardian's Chapter' at one of Sydney's top restaurants, Tetsuya's). Upon walking into the residence, the first thing I noticed was the sweeping view of Sydney harbour. The second thing I noticed was the Founder's Reserve bottle. 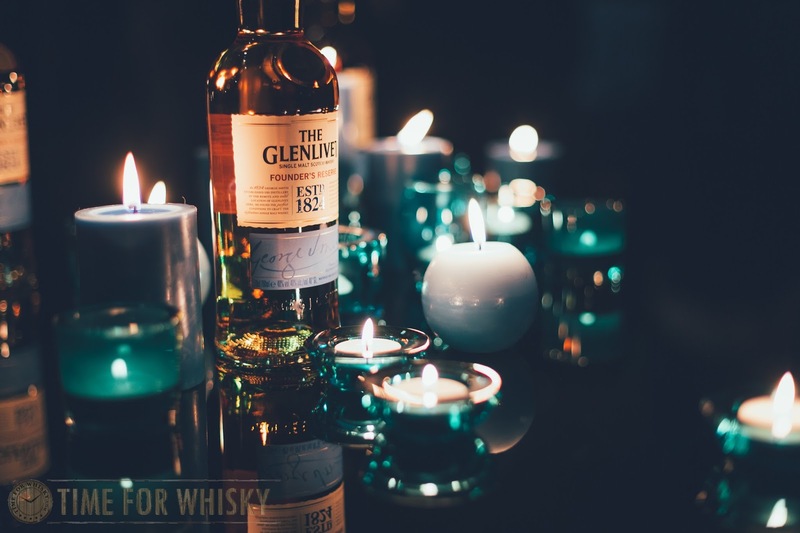 Elegantly placed and presented, the single Founder's Reserve bottle was displayed as a feature in the lounge area amongst teal coloured candles - a beautiful sight. Then there was this large Glenlivet ice sculpture which was placed next to the Bartender's table and attracted quite a bit of attention on the night -- especially from those who prefer their dram on the rocks (kidding). Various canapés, the Founder's Reserve Cocktail and the Founder's Reserve, neat, were served throughout the night and allowed guests a sneak preview of the whisky before the official introduction of the event and the Founder's Reserve expression by Pernod Ricard’s Marketing Manager, Sladjan Maksimovic and The Glenlivet’s aforementioned Brand Ambassador, Ben Davidson. 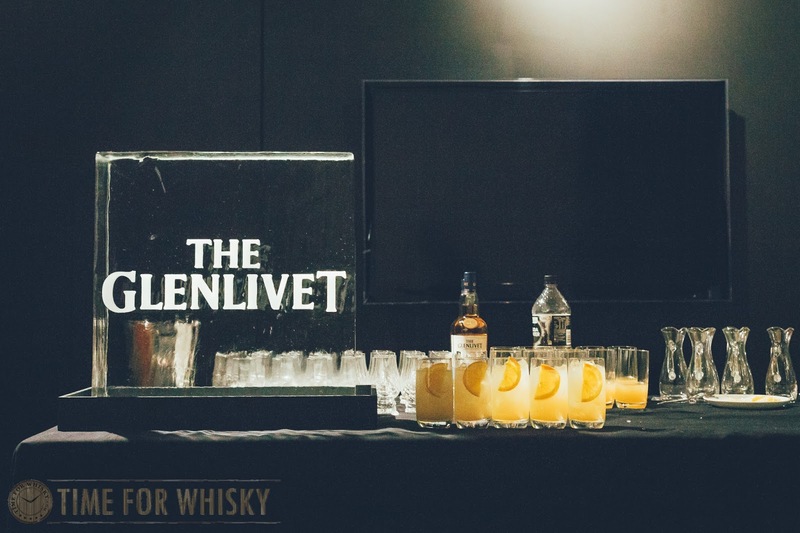 Sladjan spoke briefly to welcome guests to the event and Ben followed with a short presentation on the Founder's Reserve and its true attribution to George Smith's vision of establishing an exceptional, smooth malt whisky that was then named simply 'The Glenlivet'. Ben continued by providing a few intricate details regarding the Founder's Reserve, including the select use of ex-American oak barrels and ex-American oak first fill barrels to produce the final malt. Interestingly, the use of the American oak first fill barrels adds another level of sweetness to the final malt as all the vanillins from the American oak are absorbed by the malt, to which we shall attest shortly. Ben pointed to a couple of features on the bottle worth noting; the first being George Smith's signature, emblazoned across the bottom of the bottle, signifying George's seal of approval on the malt; and the second being a signifier detailing the Packhorse Bridge that crosses the Livet River in the Livet Valley, signifying the birth of The Glenlivet in 1824. The intention being that these details may help to market the Founder's Reserve as a more modern whisky and also one that carries a notable backstory. Shortly after the presentation, Ben suggested that we ought to pick up our share of the Founder's Reserve and take a moment to appreciate this expression. A simple, delicate single malt whisky. The smooth and sweet profile of the Founder's Reserve makes it quite a nice dram that you can have any day of the week throughout the year. Nose: The nose is soft and there are hints of peach, vanilla, meringue, orange peel with a slight toffee and oaky notes. Palate: The palate is delicate, smooth and sweet; vanilla ,toffee and caramel sweet. After some time, the sweetness on the palate then gives into hints of cardamon and orange citrus oil. Finish: The finish is relatively short and simple, though the smoothness and the sweetness of the malt from the palate lingers for a while longer. The Founder's Reserve is now available locally alongside other The Glenlivet expressions including the 12yo, though the 12yo will be discontinued after the end of the year. Thanks to the Pernod Ricard Australia and Cav Con for having us as part of, what was undoubtedly, an excellent celebration to welcome the new The Glenlivet expression into the local The Glenlivet family.